This week is another Free Spins week at Intertops Poker and Juicy Stakes Casino. 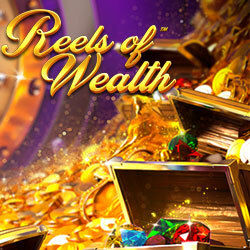 April 15-19, the casinos are giving players up to 100 free spins when they deposit. This is a great time to try some of their most popular slot games from Betsoft: Sugar Pop 2, The Angler, Fruit Zen and Reels of Wealth. Players can get up to 100 free spins with a $100 deposit but the casinos are giving free spins with deposits starting at just $25.